We all want bargains--a BMW priced like a Kia, a mansion for the price of a condo, champagne at beer prices. A newly updated PDF-editing application, Nitro Pro 7 ($100 as of November 7, 2011) claims to have the power of Adobe Acrobat at a fraction of the price. Although it delivers on the price part of that claim, it lacks some useful features, and it had problems exporting from PDF to other formats. This file is available for download in 32-bit and 64-bit versions. The most basic of Nitro Pro 7's duties is converting documents from their native formats (often Microsoft Office documents) to PDFs, as well as converting PDFs into more editable formats (again, often Microsoft Office documents). As most of the other PDF editors I've seen, Nitro Pro does a fine job of converting *to* PDF; when you install it, it adds its own menu to your Microsoft Office menus. As most PDF editors do, it performed beautifully on my test documents, producing perfect text, spacing, image reproduction, and overall layout. Nitro Pro 7 introduces a useful new search-and-redact feature. The application wasn't nearly as proficient at the task of converting from PDF to other formats. Nitro Pro offers three different modes for when it performs Word document conversions: "Highly editable (with layout)," "Highly editable (single column)," and "Precisely laid out." When I used the first mode on my test document--a 58-page, monochrome PDF computer user manual--the application took 2 minutes and 15 seconds to convert the file. That was about half a minute faster than Acrobat X Pro ($449), but it was nearly twice as long as Foxit PhantomPDF Business 5.0 ($199) required to finish the job. When I tried the "Precisely laid out" mode, which uses more text boxes to achieve more accurate layouts, Nitro PDF crashed itself and Microsoft Word over the course of many attempts. Several of the other documents that I converted--even ones that had been saved to more recent PDF specification versions--had incorrect fonts, font sizes, and spacing and missing images when they got to Word. Nitro attributed the problems to the PDF being encoded to conform to an older version of the PDF specification, and possibly due to tweaks in the most recent version of Nitro PDF. I tried using a slightly older version of the application, with the same result; the company then rewrote portions of the application and gave me access to the updated application, which performed much better, although some documents still lacked images. Acrobat had no trouble processing the same document, and produced a much better-looking document, with images. When I converted a PDF document containing large tables to Microsoft Excel, Nitro PDF reproduced the tables perfectly, with the correct fonts and table-row shading. However, it failed to include any of the text above or below the tables, and it neglected to include a graphic. If you want to import editable documents from your scanner, you must pay an extra $20 for optical character recognition capability. According to Nitro, the OCR engine is made by I.R.I.S., which makes its own Readiris Pro OCR software ($129). Without this add-on, you can scan from within the application, but you'll get only an image file, not editable text and objects. A new feature in Nitro Pro 7 is the ability to create digital signature profiles. You can create a profile quickly, even adding a handwritten signature graphics file, if you have one already. After you have created your digital signature, you can add it to any file that requires it by simply drawing a box onto a document. Nitro Pro 7 has new redaction capabilities, too. 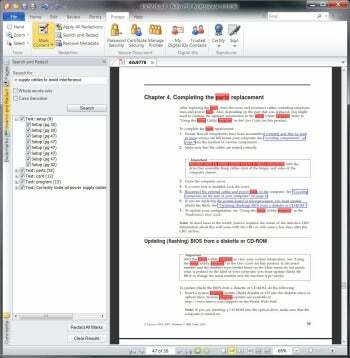 Like Acrobat X Pro and Nuance PDF Converter 7 ($100), it has a search-and-redact capability, which means that you can search on words or phrases, then mark them for the black-box treatment by checking a box. You can save a PDF with elements marked for redaction, and then send the document to someone else who can then review the elements and apply the final redaction. The application will add "-redacted" to the file name when you save, so that you have the option of saving your original. Nitro Pro 7's Help mechanisms are unusually good (though I can't comment on the quality of the actual help). Clicking the Help menu brings up links in the menu ribbon to, among more common support-oriented elements, Ask a Question, Share an Idea, and Report a Problem. These buttons make it easy to interact with Nitro's website community, which I found to be very active. True, the product itself comes with only 30 days of free company-provided tech support, and perhaps like many other companies, it is relying a little too heavily on its users to provide support after that period, but at least Nitro is taking an innovative approach to promoting that option. If you purchase a 12-month subscription to Nitro's Software Assurance Program, which costs $25 and guarantees you free upgrades should they occur during the period, you'll get tech support included, too. A PDF is a PDF? Nitro Pro 7 has a few nice things going for it, and its price makes it tempting, notwithstanding all those other competitors that come in at around the same price. But it needs to add a few more nice things to stand out from the PDF editing crowd. And if all you really need are the ability to create PDFs and perform a few mother PDF-related tasks, you might check out Nitro Reader (formerly called Nitro PDF Reader), which costs nothing and does far more than Acrobat Reader. Share files with the peace of mind, knowing almost anyone on almost any machine can open, view, and review--every time.